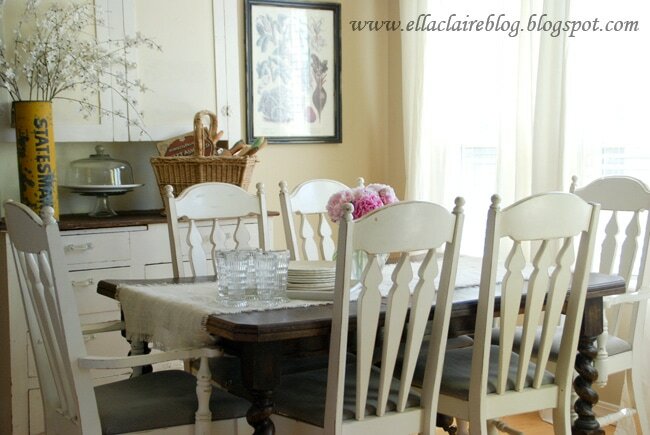 Our Home~ Pictures of the Dining Room ~GIVEAWAY starts tomorrow! I have been procrastinating taking pictures of my home for a while now. I was hoping to do it while my sister was here so she could guide me through from a photography standpoint. She is such an amazing photographer and I need all of the pointers I can get! Well, we played a little too much and didn’t do it, so after she left, I got her pointers over the phone. ChiWei and Kristin were so sweet to ask me to post pictures of my home and it gave me a good little nudge! I will be posting pictures of my home over the next week or two, off and on with other posts. I have a few other fun things planned… including a super exciting GIVEAWAY starting tomorrow. 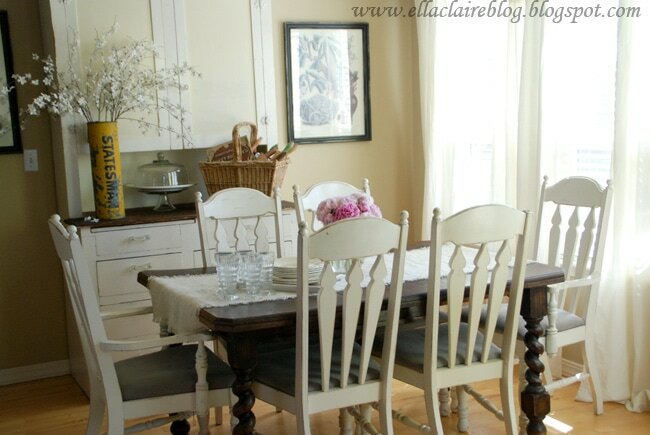 Anyhow, my favorite thing about our dining room is the three big windows that let in all of that beautiful light! We got our table while we were on vacation on the Oregon coast. It came out of the old Seaside Inn. I saw her pretty legs, and it was love at first sight! I keep the leaf in the table so we have the extra seating, but when it is removed, the table is square. The fun thing is that it has the original old crank and everything. I found these chairs at a thrift store, and I really need to give them a fresh coat of paint and new cushions. Isn’t it funny how you can look at rooms in your home and just pick apart all of the things you want to do to fix/change it? 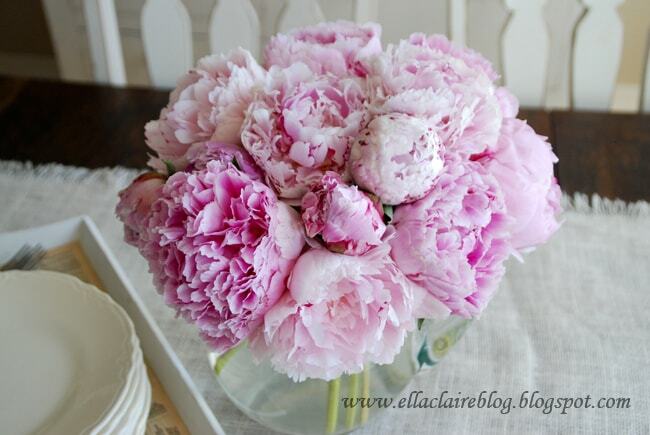 My hubby took me on a date and bought me these gorgeous Peonies. Every time I see them, they make my heart skip a beat. 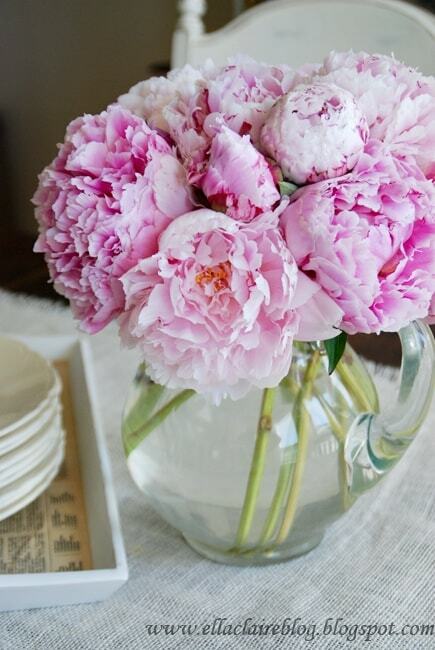 I love, love, love Peonies. They were my wedding flower, and I have been known to slow down or slam on my breaks just to admire them growing in people’s yards. 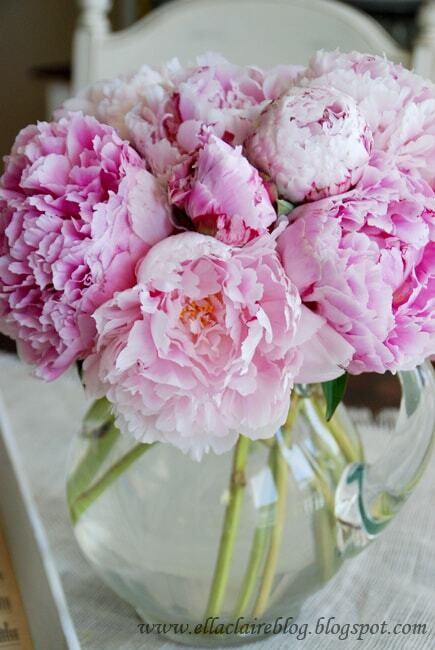 I think my husband thinks I am a little obsessed, but come on… they’re Peonies! I haven’t quite figured out what I want on this cabinet yet. Actually, I have changed it again since I took these pictures. I really love this beast of a furniture piece. I say beast, because it is huge, tall, and heavy! 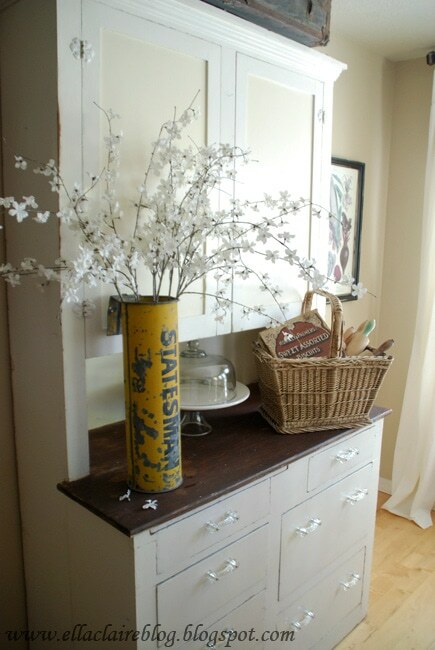 It is a cute original farmhouse cabinet, that looks handmade to me. 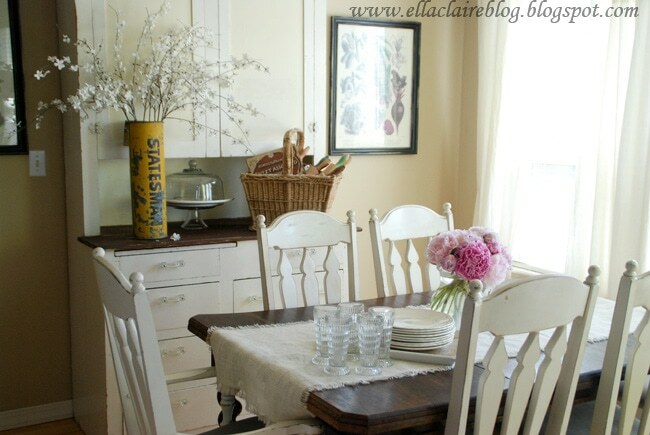 I love the dividers in the flour drawer, the little cutting board that pulls out, and all of the chippy paint. I found that “Statesman” newspaper holder at a yard sale on an old farm nearby. It is a local antique that was used for our paper- The Idaho Statesman. Here are a couple more pictures of the most beautiful flowers in the world. I am so, so, so excited to post my GIVEAWAY tomorrow! 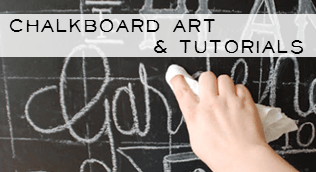 This one is really fun… so be prepared to tell all of your friends. 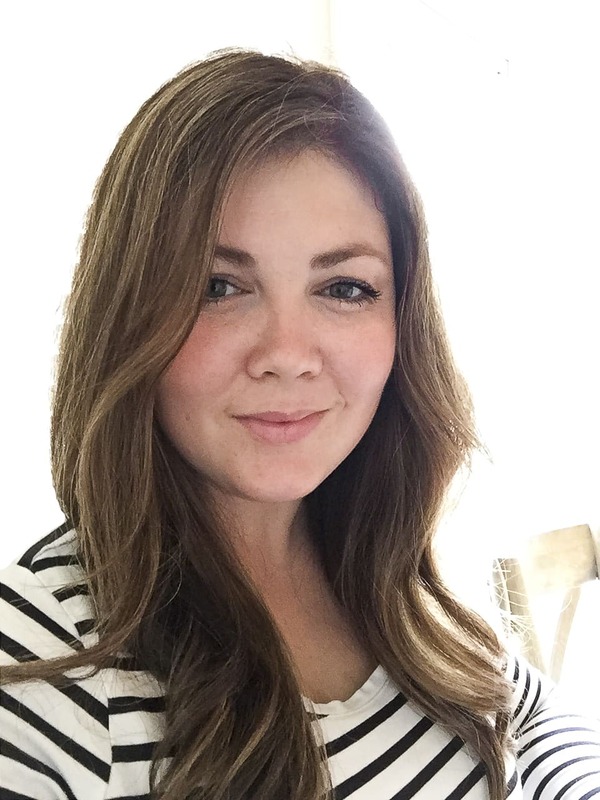 I’ll give you a hint… vintage inspired party decor! Well, can I just swoon now? And then, when I pick myself up, I’ll just head on over and plop down at your house and stay a while 🙂 Our row of peonies didn’t do so well this year, I’m hoping my hydrangea will produce some big healthy blooms! 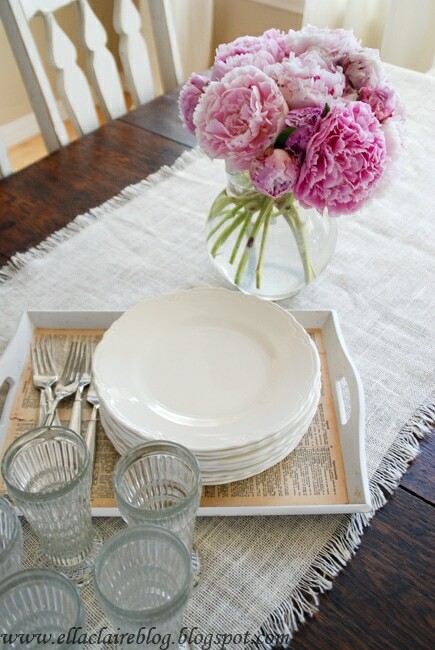 Love… The peonies are fabulous, and I love the Statesman newspaper holder!!! That’s such a pretty room! I love that cabinet. Wonderful room so sweet and charming. Oh so pretty Kristen! 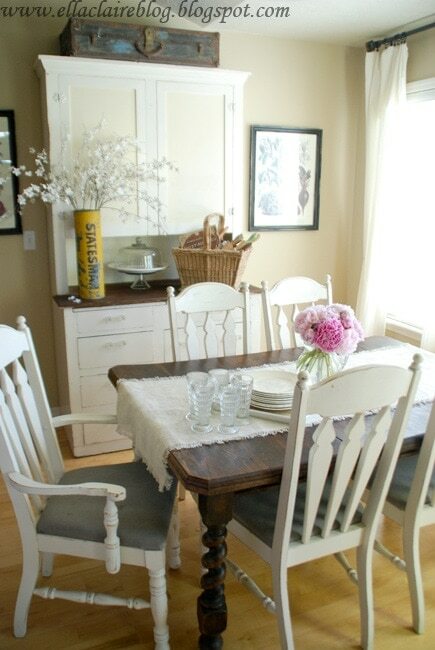 Love the table, it has to be so neat with the crank and all! Also the cupboard, makes me wonder what my hoosier would look like painted white! Sweetly divine. 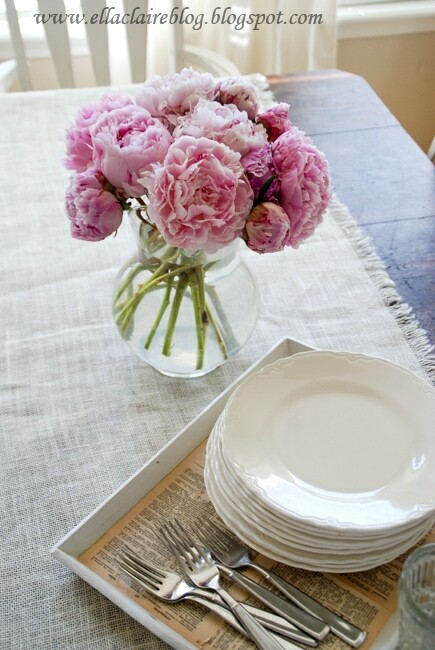 I lov eyour soft palette with the pink peonies. 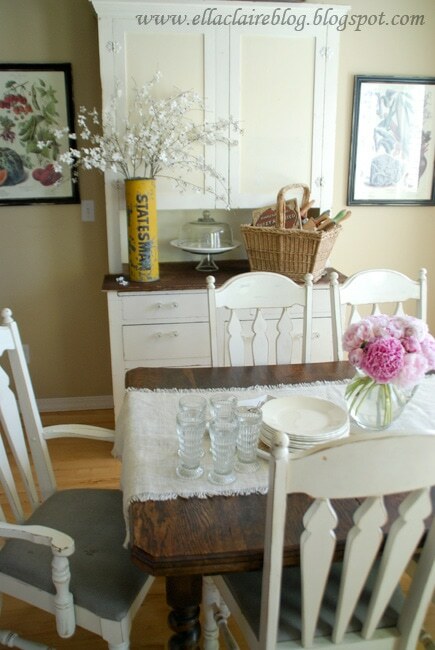 Love, love, love your dining room! Especially the Statesman newspaper holder, what a fun accent! Just wondering if you made the table runner? Love the whole look! 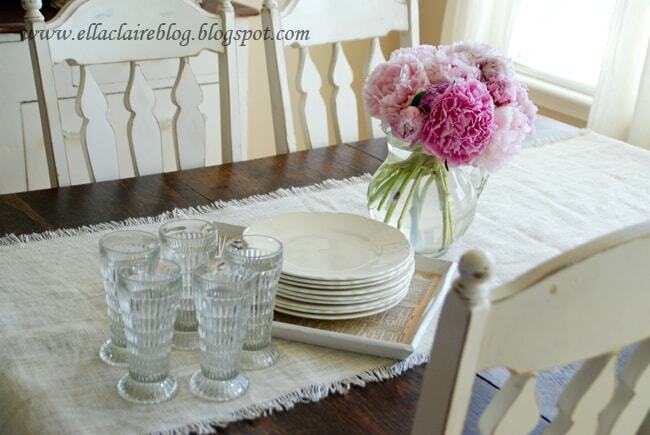 Love the dining room–everything is beautiful–from the table itself to the runner to the Peonies! Oh, how did I miss this post! Kristen your house is so beautiful. 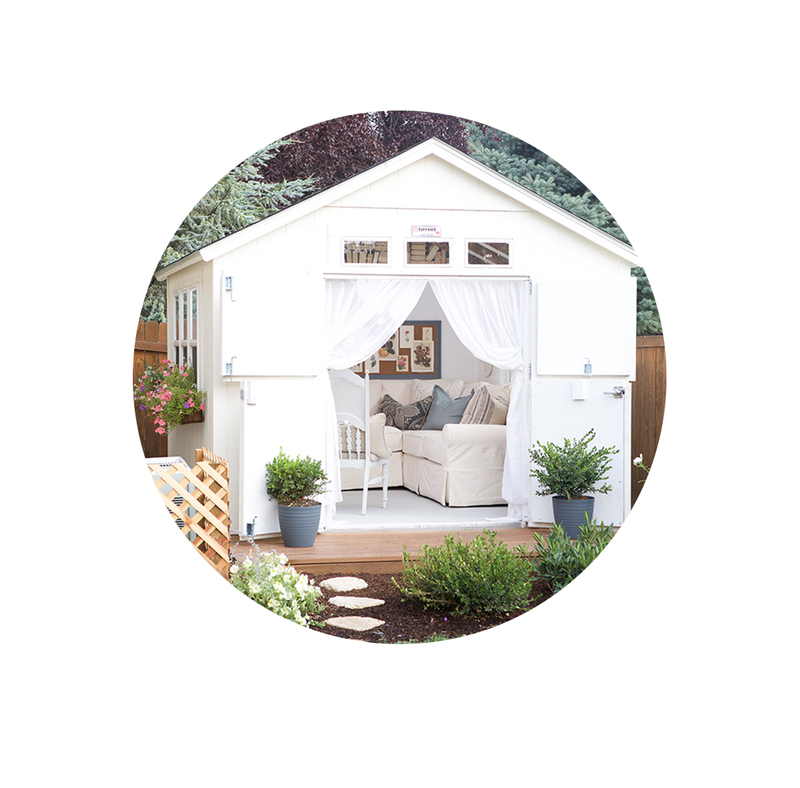 I love that it looks so comfortable and livable too. I’m having serious home envy!! Have you considered putting a piece of mirror on the back of the cabinet, behind where your cake stand is sitting?